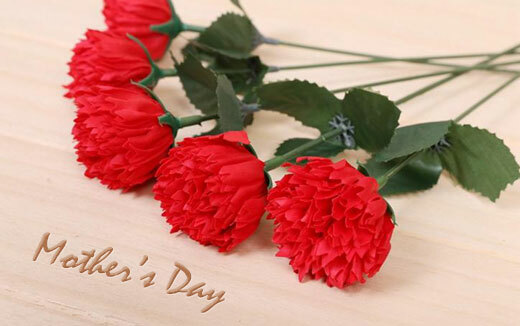 The carnations have become such a familiar part of Mother's Day observance that they are said to be an emblem of mother love. But why and how these flowers came to associate themselves with the Mother's Day? Also called GRENADINE, OR CLOVE PINK, this herbaceous plant is a native to the Mediterranean area. Its fringe petaled flowers often have a spicy fragrance. There are two general groups, the border, or garden, variety and the perpetual flowering variety. Border carnations include a range of varieties and hybrids. All flowers come in a range of colors, and are usually less than 5 cm (2 inches) in diameter and are borne on wiry, stiffly erect stems. The perpetual flowering carnation, perhaps derived from crosses between the border carnations and the China pink, produces larger flowers. The flowers of this variety blooms almost continuously in the greenhouse. Carnations are among the most popular cut flowers, used in floral arrangements, corsages, and boutonnieres. In Europe the carnation was formerly used as a treatment for fevers. It was also used to spice wine and ale during Elizabethan times, as a substitute for the more expensive clove. In 1907, Miss Anna Jarvis selected the pink carnations as the symbol for Mother's Day. So, like the Day itself it was Miss Jarvis who made it a part of Mother's Day. She introduced and supplied these white carnations at the first service conducted in Grafton, West Virginia. They were chosen because of her mother's fondness for them. May be, at first they were not exactly picked up on an emblematic sense. But they were immediately accepted as appropriate for the occasion. It was the inherent quality of sweetness, purity and endurance that made the carnations so popular on Mother's Day. Later, white carnations, with their sweet fragrance, came to be regarded as the flowers meant for those who have missed their mothers. Missed, either because of death, or, because of staying at a distance. And it was the red carnations which in course of time became the symbol while wishing a living mother love. Perhaps, red, the color of blood and heart, was thought to be more suited to represent life and love..